Artillery RTS Cannon Brawl hasn’t been in beta for long, but it’s already gearing up for a full release next month. Developer Turtle Sandbox announced the September 19th launch date a couple of days ago. While beta went by quickly, the game has been on Steam Early Access for a bit over a year. The colourful cartoon aesthetic belies the surprising depth of this RTS artillery hybrid, which takes as much from the likes of Worms as it does from more straight-faced, traditional strategy fare. But at it’s core, it’s about blowing the crap out of an opponent’s castle. On top of a quest-filled campaign, there’s a nightmare mode and puzzle levels, which will stress you out and relax you, respectively. I took it for a spin last month, just after it hit beta, and good times were had. There’s something therapeutic about launching oversized missiles and searing fortresses with lasers while flitting about in an airship. 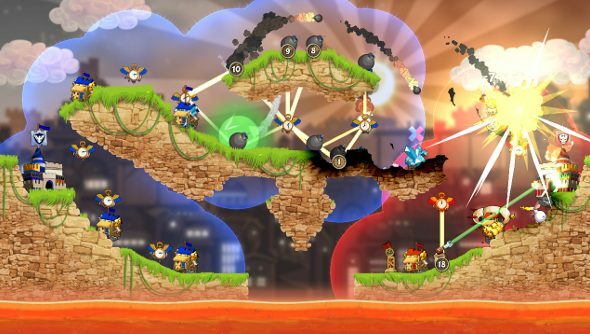 You can grab Cannon Brawl on Steam for £10.99/$14.99.